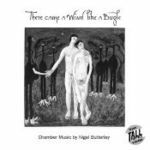 There came a wind like a bugle : chamber music / by Nigel Butterley. There came a wind like a bugle / Nigel Butterley. Instrumentation: 2 soprano, 2 alto, 2 tenor, 2 bass voices or SSAATTBB chorus. Contents note: There came a wind like a bugle -- To my quick ear -- A wind that rose -- The red blaze -- Banish air from air -- Ashes denote that fire was -- Presentiment -- Departed to the Judgment -- I went to Heaven -- It was a quiet way. May be performed as a vocal or choral work.